100 Followers, What? + Giveaway! Guys, this is crazy! I’m in Starbucks today and I hit a hundred followers! Guys that’s insane. Well I actually hit a hundred followers a few days ago, with those who get posts emailed to them, but that doesn’t count to WordPress, so the official hit happened today. Anyway this is just really weird to me that a hundred people read my blog. Like that’s insane. I honestly can’t believe this. It took me longer to hit a hundred twitter followers which is weird because I know people on twitter and I only know two people in real life that follow me through actual WordPress and not email. I’m so thankful to all of you because I don’t really blog about anything imparticular and I usually just put a bunch of feelings and annoyances here and you guys read it and it means a lot to me. To be honest this is just really overwhelming and I’m so grateful for every single one of you! If I could I would hug you all, but I’m not really touchy so I might not actually do that even if I met you. Actually I might because if I met any of you in real life I would be really excited. Now I’m just rambling per usual. So I really just wanted to come up with a way to thank you guys, so I decided to a (very,very) small give away! I think I’ve only ever entered one or two give aways on YouTube and I’ve been really unsuccessful, however they’re still fun so I’m going to do one. The things I will be giving away are things that I really like or I saw at Target and I thought they looked cool. So I’m just going to list all of the items and why I chose them and then I’m going to explain the rules and boring stuff like that. 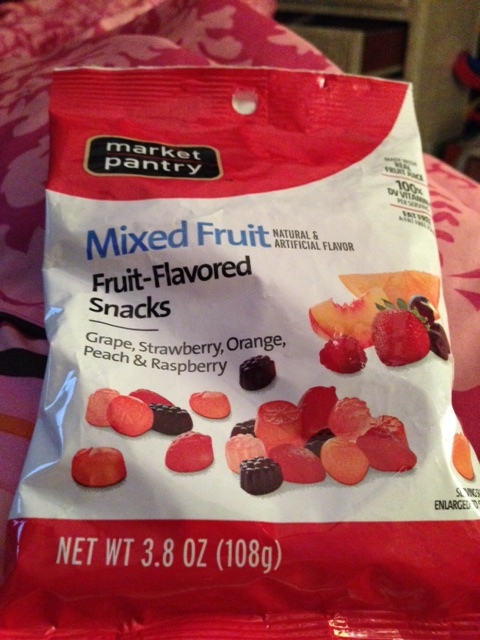 Mixed Fruit, Fruit-Flavored Snacks, this is because I love fruit snacks so much. I love them. I love them. I love them. 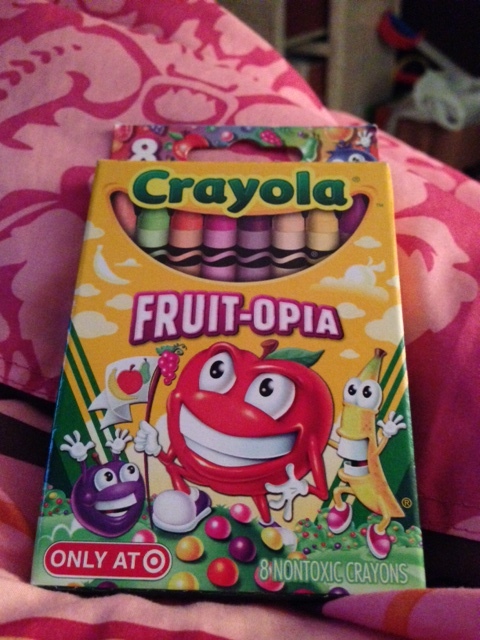 Fruit-opia 8-pack of Crayola Crayons, because who doesn’t love to color? I know I do. 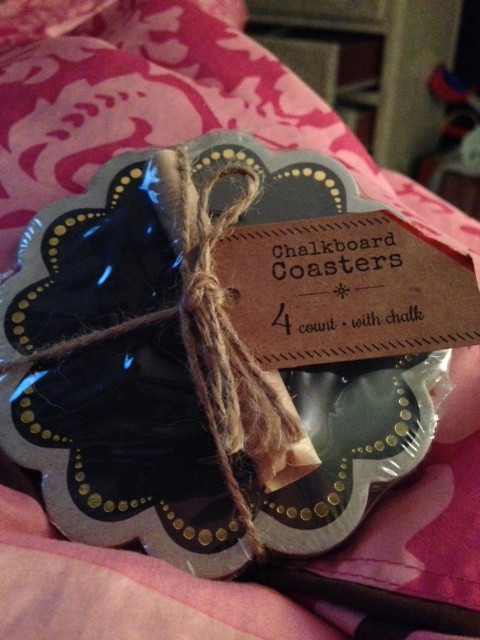 Chalkboard Coasters, Katie pointed these out to me out Target and they’re just so cute so I thought why not throw that in this giveaway? 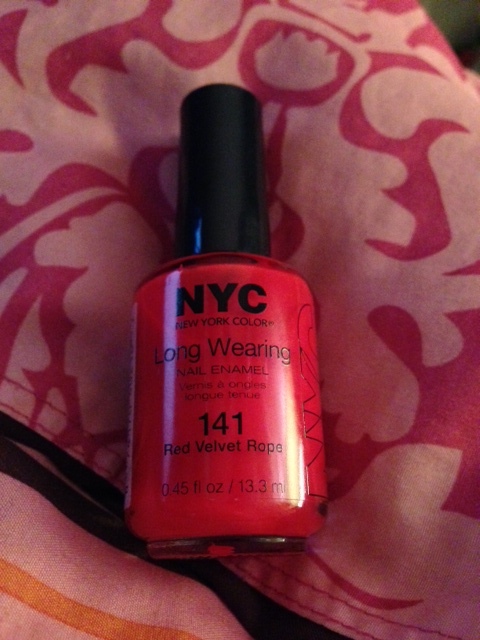 NYC Red Velvet Rope nail polish, it’s not like super red so I thought it would be a pretty spring summer color and painting nails is just one thing to do while you procrastinate, which is my area of expertise. NYC Tudor City Teal, it’s just so pretty and teal is just in lately. 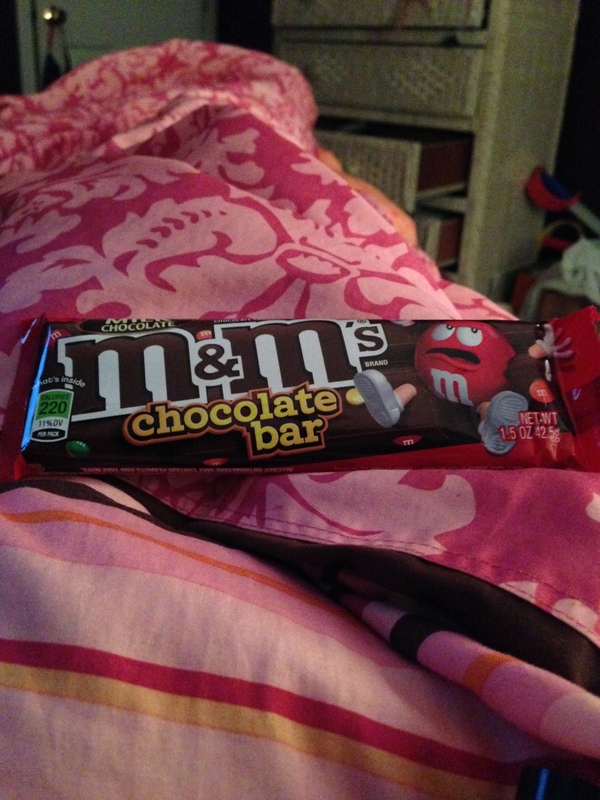 Finally, I had to include some type of chocolate and a lot of people don’t know this doesn’t exist so I thought I should throw this in there too, an m&m chocolate bar. It’s made up of mini m&ms, which are far better than regular ones if you ask me, and it’s just delicious, I’m trying not to eat it myself to be quite honest. Okay so that’s the small giveaway items now for the rules and all that stuff. So obviously you have to be following me because that’s what this is all about obviously, thanking all of my lovely followers. I’m also going to ask you to like this post, and either comment with your favorite post that I’ve written or why you decided to follow me. I will chose the winner Saturday March 15, 2014 at midnight, so you have until 11:59 March 14 to enter. I will then reply to the winners comment with my email and ask them to email me their address. Seriously thanks again everyone, I’m so thankful for every single one of you and I hope that you’ll stick with me through the posts to come. If you have any questions comment with those too! I’m also not going to be putting this post on any social media sites so that you guys are the only ones who are open to this because I’m not thanking them, I’m thanking you guys! Thank you so much! I love you guys so much, you mean the world to me.